Infidel753: The Grenell resignation -- who's the boss? The resignation of Richard Grenell, just a week after being hired by the Romney campaign as its foreign-policy spokesman, is more than merely one more example of right-wing anti-gay bigotry. Bigotry was certainly there, notably from Bryan Fischer and the "Family Research Council". But the real story here is the affirmation that, in today's Republican party, it's the Christian Right that calls the shots -- and Romney is willing to let them. That might seem an odd assertion since Grenell quit rather than being fired, and the campaign issued a statement that "We wanted him to stay because he had superior qualifications for the position he was hired to fill." Romney, however, never stood up to the pressure over Grenell. The campaign did not even make use of him for "the position he was hired to fill", since he immediately became the target of a firestorm of fundie fulmination. As for Romney himself, a "Sister Souljah moment" might have been too much to hope for, but given the virulence of the attacks on a member of his campaign, a firm public statement of support and a finessed but clear rebuke of Fischer would not have been amiss. In fact, as far as I can see, the campaign did nothing meaningful to prevent Grenell from being hounded out. I even wonder if hiring Grenell was something of a trial balloon, via which Romney was testing how much tolerance the Christian Right would show toward deviation from its orthodoxy as he tries to pivot toward the center for the general-election campaign. If so, he has his answer. And we have ours. To all those who think Romney is a closet moderate who only took extreme positions for the sake of the primary contest, and would govern from the center if elected, think again. He likes to claim that the only reason he governed as a moderate in Massachusetts was that he had an overwhelmingly-Democratic state legislature to contend with, and I think he's telling the truth there, in the sense that matters most. It's not that he is or isn't a closet moderate; I don't know, and that isn't the point. The point is that he's willing to be a captive of the political forces acting on him. If he won't stand up to Fischer over an issue of campaign staffing, why should we think that, as President, he'd stand up to Boehner and McConnell and the whole menagerie of theocrats and bigots that infest the right wing these days? Look at the right wing of today as a whole, and what you're seeing is what you'd get from a President Romney. Update: For more on the true cowardice and appeasement displayed by the Romney campaign, see here, especially the updates at the end. "The point is that he's willing to be a captive of the political forces acting on him." Which we've seen with his incessant flip-flopping. I don't want someone that spineless in the White House. 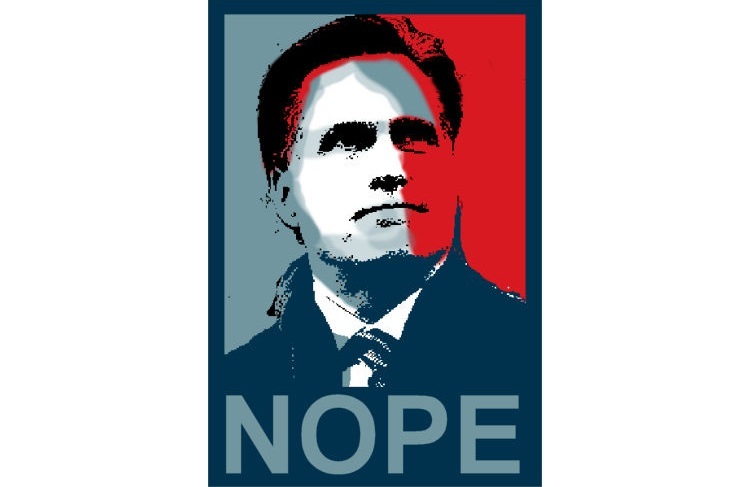 And yes, it would not bode well if Romney were elected president and right-wingers had his ear. Regardless of the campaign rhetoric, it's difficult to predict what any candidate will actually DO once elected to office. Obama was going to close the detention facility at Guantanamo Bay and enact sweeping regulations over Wall Street. The first hasn't (and apparently won't) happen, the second is being criticized as tepid at best. Would one term this a "flip-flop"? I also become concerned when we focus all our attention on the occupant of the White House when tremendous power is wielded by Congress... and even more influence over THEM by extremely well funded lobbyists. Ahab: All the more since they don't trust him. They'd be watching him every minute to keep him on the straight and narrow. RtS: True -- all we can do is hypothesize based on what's known about the candidate, which is usually quite a bit. As for Congress, I've long pointed out that it's equally important. We need to focus on both.